Health Connectors provide one-to-one support for people to make positive changes to improve their health and well-being. This service is free of charge and is open to adults aged 18+. You can be referred by a health professional, an organisation or you can self-refer by contacting us. How a Health Connector can support you. Health Connectors listen to your health story and can give you information about local services such as support groups and activities. They can help you connect with your community in a way that suits you. You’ll speak with a member of the team who will arrange with you a time to meet to have a chat about what you would like to do, your interests and how we can support you. The project is about empowering you to do things for yourself. Health Connectors provide short term support, helping you to take the first steps to finding the support you need and making sustainable changes. We can signpost to other agencies/resources if this would be more appropriate. 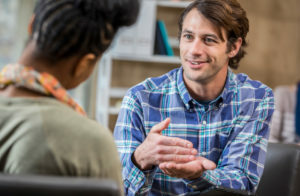 Health Connectors work one to one with people to help build knowledge, skills and confidence by providing information, advocacy, coaching or just a supportive ear to help people improve their health and well-being or manage their long term condition.